4/01/2012�� Hi All! Went to Michael's tonight to just get out for awhile and discovered some new yarn. 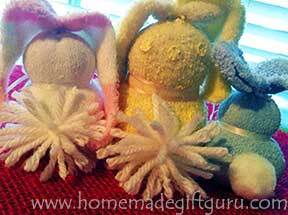 It is made by Loops and Threads and it is all little pompoms with some thread in between each pompom.... 6) Decorate to make a bunny. Above shows the shapes we cut out of felt and with lots PVA we glued them all on and let dry. DONE! Above shows the shapes we cut out of felt and with lots PVA we glued them all on and let dry. To make the stitch, yarn over twice as if beginning a treble crochet stitch, insert hook into work, and draw up a loop (four loops on hook). Yarn over and draw through two loops (three loops on hook), and, finally, yarn over and draw through all three remaining loops.... So I designed a pattern around this style and used the plushiest yarn I could find to make this Bunny the cuddliest, most squeezable stuffed toy possible. Later, I found out that the inspiration for this funny bunny comes from a free pattern on Amigurumi Today, which you can find here . So I designed a pattern around this style and used the plushiest yarn I could find to make this Bunny the cuddliest, most squeezable stuffed toy possible. Later, I found out that the inspiration for this funny bunny comes from a free pattern on Amigurumi Today, which you can find here .... 4/01/2012�� Hi All! Went to Michael's tonight to just get out for awhile and discovered some new yarn. It is made by Loops and Threads and it is all little pompoms with some thread in between each pompom. 4/01/2012�� Hi All! Went to Michael's tonight to just get out for awhile and discovered some new yarn. It is made by Loops and Threads and it is all little pompoms with some thread in between each pompom. 6) Decorate to make a bunny. Above shows the shapes we cut out of felt and with lots PVA we glued them all on and let dry. DONE! Above shows the shapes we cut out of felt and with lots PVA we glued them all on and let dry.